Prototype: 2 German Federal Railroad (DB) type Rmms 33 stake cars. The cars look as they did in Era III. One car does not have a hand brake and does have wooden sides and wooden stakes. The other car has a brakeman's platform, metal sides, and pressed metal stakes. Hanomag delivery truck with a flatbed. 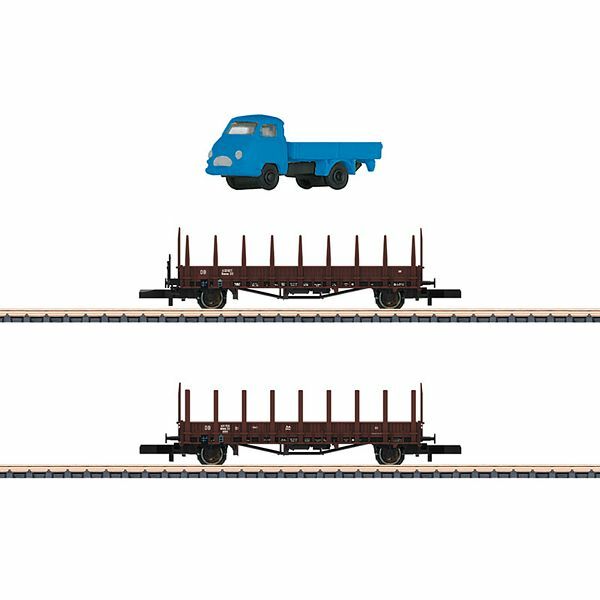 Model: The railroad cars are finely detailed and include brake imitations lined up with the wheels. The railroad cars have extensive paint schemes and lettering. Removable stakes are included. Length over the buffers 130 mm / 5-1/8". The delivery truck is constructed of metal and includes window inserts and rubber tires.